I sometimes forget to mention some of the articles I have written for the absolutely fantastic blog Global Couture. You should seriously check out the blog (not only for my articles 😉 ) they have fantastic stories, awe inspiring naturals, hair tips and much much more! 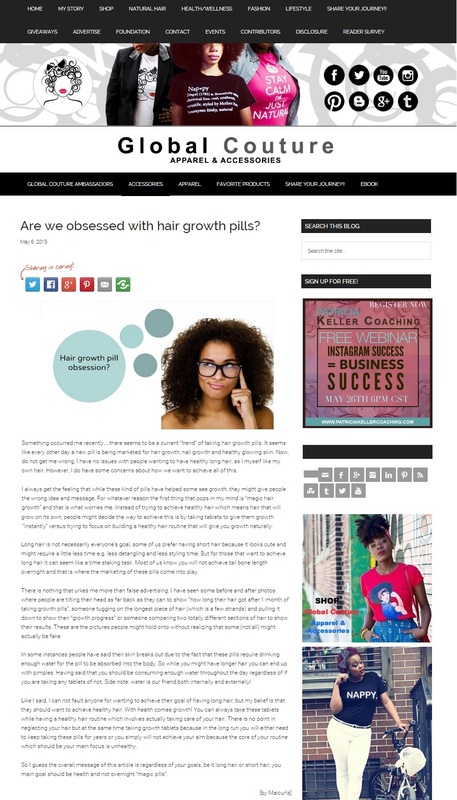 Are we obsessed with hair growth pills? I wrote about the sudden emergence of hair, nails and skin pills everywhere! Now before I get the side eye, I mentioned in the article and will mention here that I have nothing against these types of pills (as long as they are healthy and if they happen to be all natural even better). However, my “issue” with them is if they are used as a replacement for healthy hair routines. If they are being taken in place of having a good healthy routine that involves giving ones hair tender loving care in the hopes that you will wake up with “long luscious healthy hair” that is when I frown. I also have issues with false advertising! Seriously false ads give me allergic reactions! I believe that the vitamins, minerals etc in the pills can help our hair of course however, I have seen some before and after pictures that are just blatant lies! E.g. people tugging on randomly long pieces of hair with their neck almost bent completely back to show “how much growth they saw in 1 month”. Some fall victim to a vicious cycle of not having a healthy routine, turning to the “quick fix” tablets, a setback and then repeating it, all in the hopes that the tablets will give them the results they long for and they just end up spending tons of money and time. Again that is when I frown. I cover all of this in the article and would love to hear what you think! This entry was posted in Global Couture, Natural Hair Site, Skin Hair Nails Pills and tagged Gloal Couture, Growing natural hair, Hair, Hair growth pills, Healthy hair care, Healthy Natural Hair, nails, Nails skin hair pills, natural hair, natural hair care, Natural hair goals, Natural hair growth, Natural Hair Magazine, Skin on May 22, 2015 by Maicurls. Great article! This whole “quick fix and about to get 6 inches in 2 months” is simply ridiculous. That surely cannot be healthy for you either. You get all the vitamins you need from eating right, drinking water, and it helps to exercise. I think women are throwing money away on the whole “hair vitamins” thing. Plus, if you care for your hair like you are supposed to, growth will come. And if you need to take vitamins, a multivitamin is good enough. But you will not catch me paying $30 for pills. Nope. Thank you hun! I agree with you. Regardless of whether I take my vitamins or not…my hair maintenance is consistent! I can only imagine the amount of all the concentrated vitamins and minerals in the pills so I can see why they do benefit our nails hair and skin however like you said hair maintenance is key. People can take 100’s of tablets containing high concentrations of biotin but if their ends are dry, brittle and snapping off of course they won’t see any growth because as it sprouts from the roots the ends are breaking off. I have considered trying some nails skin and hair pills but I have a funny feeling I would be part of that group that would break out with spots because of the biotin lol. My skin is uber sensitive…we will see. Regardless, I would of course keep my hair routine to ensure I am giving my hair TLC. I’ve seen a difference in my nails, and my hair does look much thicker. I’m talking about the hair that’s been growing since I’ve been taking my Hair,Skin & Nails gummies. Now, I didn’t see a difference until my second bottle of 120 gummies, and only on the new growth. Thicker was what I was shooting for anyway. I already know hair grows on it’s own, but I really was hoping for thicker hair since my hair is so fine. Thank you for sharing hun.